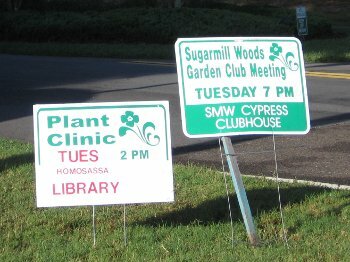 The Sugarmill Woods Garden Club and Plant Clinic is a volunteer organization of Sugarmill Woods residents who are interested in gardening and plants to beautify their homes, the village in which we live and the surrounding areas. 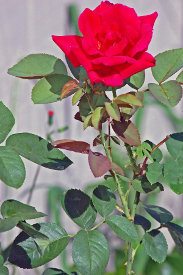 Members include Master Gardeners, newcomers, and anyone who has an interest in this area. Membership is open to all residents of Sugarmill Woods. Garden Club Meetings are held at the Sugarmill Woods Country Club at 7:00 PM on the second (2nd) Tuesday of each month, September through November and January through May, except as noted. There are no formal meetings planned for April, June, July, August, and December. Guests are always welcome. In place of the April meeting, there is an afternoon picnic at Fort Island Trail. A Christmas Luncheon is held in lieu of the regular December meeting. Details are announced at the regular scheduled meetings. Non Members will also be invited for the luncheon for an additional $1.00 charge. The SMW Garden Club has an annual plant sale each spring at the Oak Village Sports Complex (Oak Village Tennis Courts and Pool). Please watch for more information in The Greenbelt Gazette. Quality plants are offered at great prices! Plant sale items include Flowering Plants, Small Shrubs, Flowering Trees, etc. Includes Native Plants and Trees. Other sale items include Garden Trash N' Treasures, Flower Pots, Garden Tools, Vases, etc. 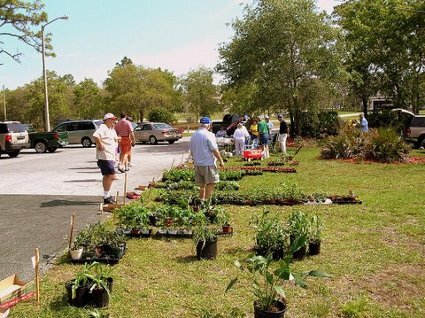 The Plant Clinic is an educational program of the University of Florida Extension Service and is sponsored by the SMW Garden Club. A Master Gardener is present at all clinics to teach and answer questions and diagnose plant problems. Clinics are held at the Homosassa Library located on Grover Cleveland Ave at 2:00 PM on the fourth (4th) Tuesday of each month year round except for December. Please watch the Greenbelt Gazette for the notification of any changes. The Plant Clinics are open to all residents of Florida. For additional information, please contact President DENNIS WASSEWLL at (352) 382 - 2553 or via email .